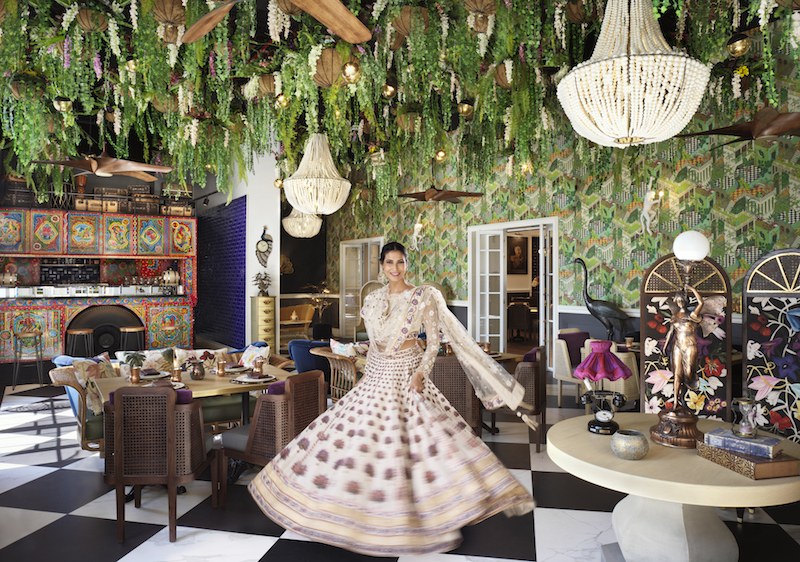 Ms Singh said that she wished to share her eclectic experiences from her adventures across India and the world, by presenting us with ‘Hindustani culinary pleasures on a plate’. She said that her kitchen was filled with secret Indian ingredients and spices she had purchased from hidden streets in old Delhi. And these spices she said would be cooked in her kitchens, for us to enjoy. 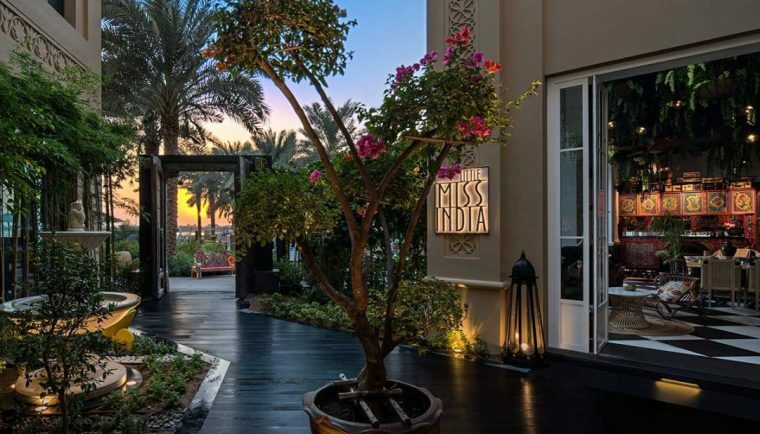 Now before you ask us more about Ms. Singh, all we have to say is that you have to visit her at her home at ‘Little Miss India’, at Fairmont The Palm in Dubai and get to know her and her delectable home cooked food, first hand. 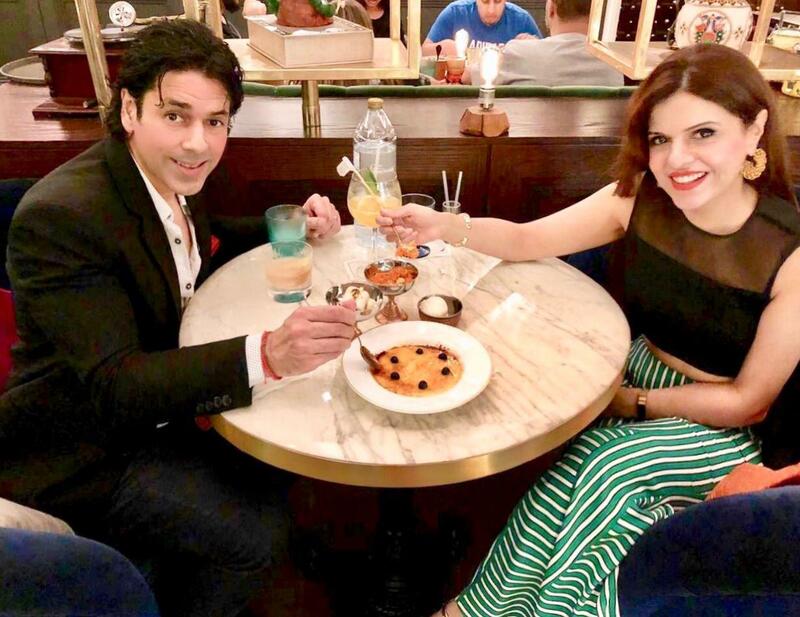 At ‘Little Miss India’, the food cannot be classified as molecular gastronomy, culinary science, progressive cuisine or any special kind of chemical food transformations. There are no garnishes or miniature tasting portions, no frills, no flowers nor liquid nitrogen on a plate for effect. Instead, what the diner gets is pure wholesome, delicious Indian food, which you will want to come back to relish again and again. 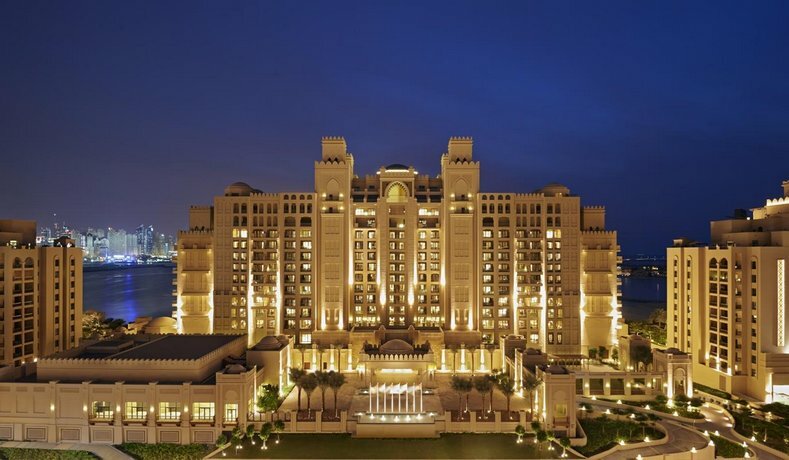 Of the 4 nights we were at The Fairmont, The Palm, we chose to eat at the restaurant twice and this had little to do with the fact that we’re Indian and love Indian food. We saw repeat guests from the US, and when we asked them to comment on their experience at the restaurant, they responded saying, ‘the food is simply too delicious, the best Indian we have ever had and quite literally, finger licking good.’ Incidentally, they were staying at the hotel for 10 nights and this was already their 4th meal at the restaurant. What is interesting for our readers to know is that Ms. Mohini Singh is a fictional character played by Ms Prachi Mishra, winner of Ms India Earth 2012. 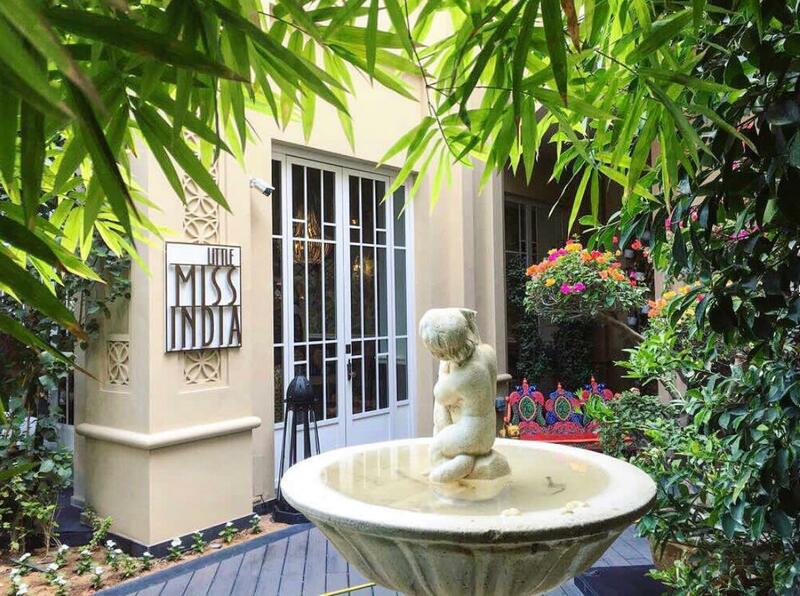 How very clever we thought, as Abhijit Gurav, the gregarious and charming Restaurant manager at ‘Little Miss India’, traversed us through the delightful life of Ms. Singh. 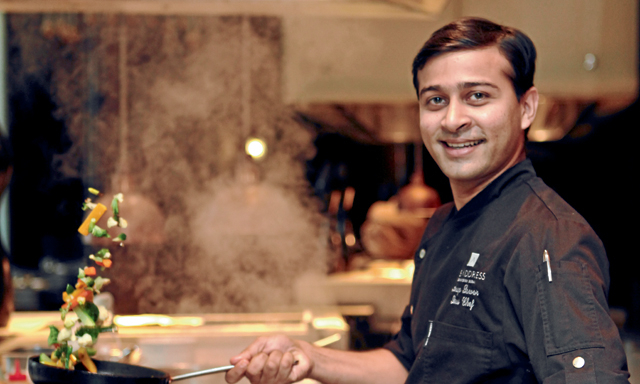 Abhijit introduced us to an exciting menu with regional Awadhi flavours from the Northern parts of India. We found the names of the dishes to be enticing and the descriptions of their individual preparations, called out for our attention. Waiting on us that evening was Baloo, who was keen we started with a cocktail. He recommended we have our cocktail in the glass lounge area of the restaurant. 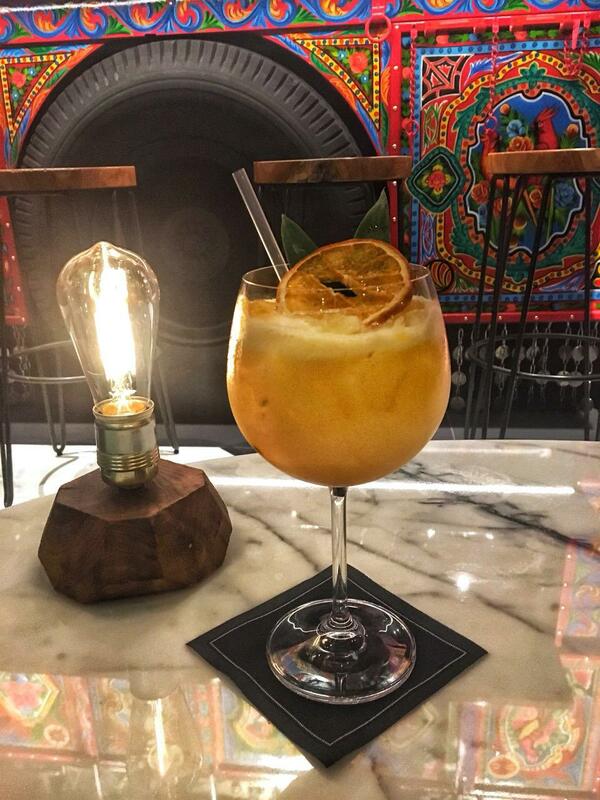 We marvelled at the decor in the glass house, where the very talented mixologist Joel presented us with Joel’s remedy’, a Gin based drink, muddled with fresh mint, cucumber and Kaffir lime with splash of vermouth. Beautifully garnished with cucumber strips and served in a burgundy glass. Indeed a perfect cocktail to start the evening. Joel’s bar was at the back of a bright and colourful truck, the front of which extended onto the outer patio, where guests of ‘ Little Miss India’ could also choose to dine. The lounge area were we were enjoying our drink was decorated with pearl beaded chandeliers, peacock wall clocks, old-world wooden ceiling fans and low hanging green plants. The interiors of this section of the house was reminiscent of a weekend home of a wealthy Indian heiress. With drink in hand, Laveena and I walked into the main dining area and found ourselves in a room reflecting the colonial rule in India. 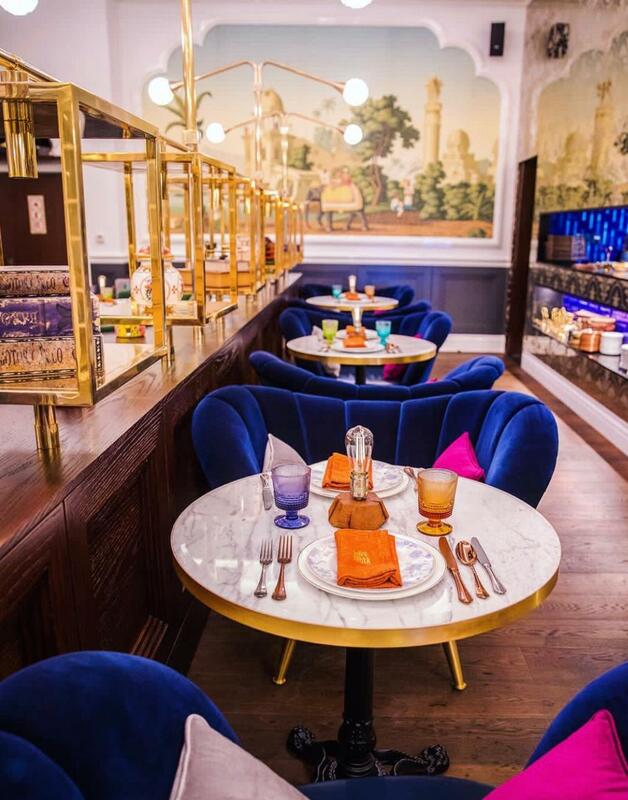 Large royal blue velvet chairs with bright pink cushions, circular table tops made from rich white marble with gilded gold borders and carved wooden bases, old Mughal paintings of Maharajas on their hunting trips, mounted on the back of their elephants and views of a busy kitchen with Chef’s hard at work at their large tandoors. Restaurant Chef at Little Ms. India, Mr. Mohammad Arif, came over to our table and introduced himself. When I asked him to recommend a few dishes, Arif promised that he would surprise us with secret recipes from the spice filled travel trunks bought over from India by Ms. Mohini. And off he marched, smiling, lost in his delightful world of Ms Singh and her Indian kitchen, to work his magic. And magic it was, for what followed over the next 90 minutes was a truly pure and unadulterated seduction of our most refined culinary senses. 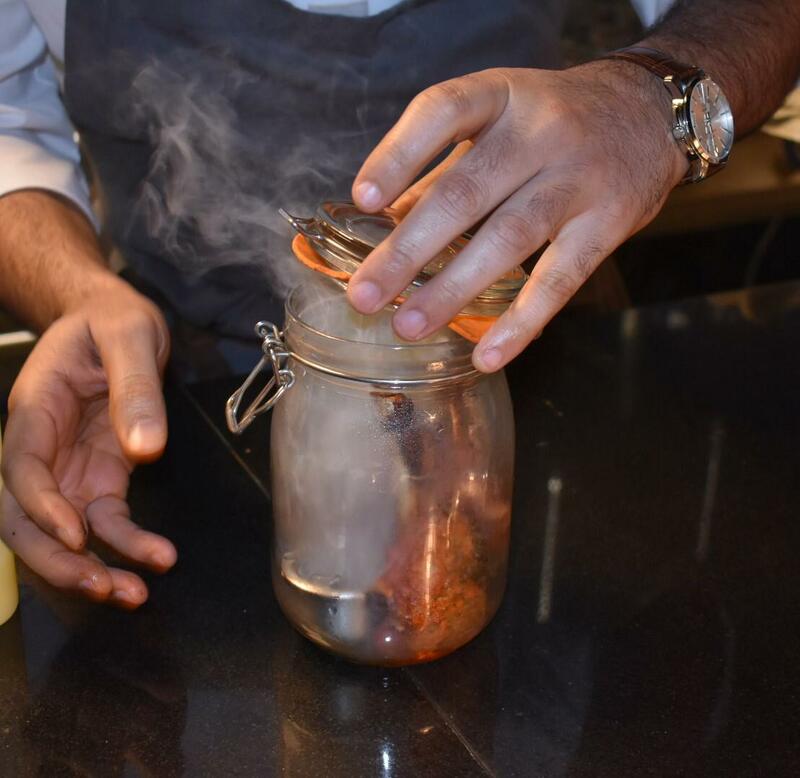 Arif first sent out the Bhatti da Smoked Lamb Chops, tender barbqued prices of lamb marinated in 12 unique Indian spices and smoked in a jar. I prefer my meat off the bone, but I found it hard to resist sucking on the masalas of the juicy bone, long after I had devoured the soft and delicious meat. 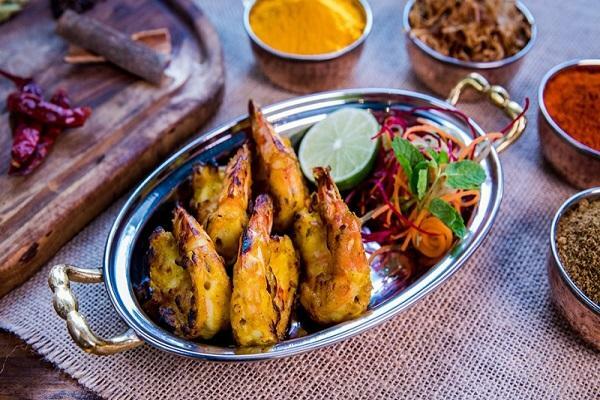 This was followed by the Sunehra Jhinga, delicious prawns marinated in lemon, turmeric and saffron.A generous helping of the boneless white fish marinated with mint, the Hariyali Tikka was next presented to us as a starter. 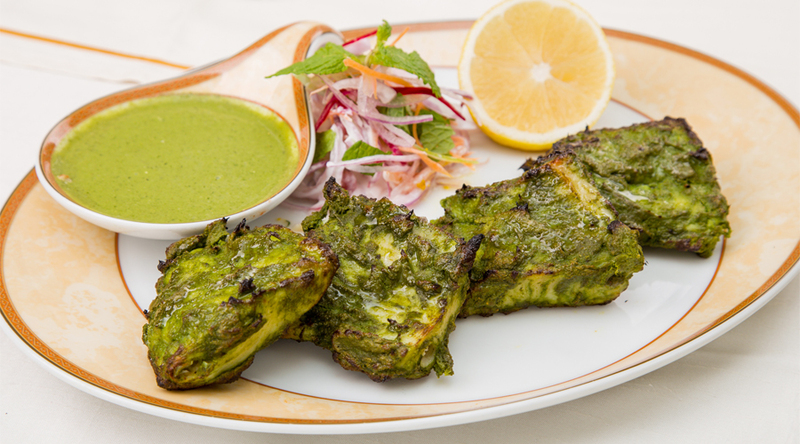 The ever so fresh, boneless white fish melted in our mouths while creating a sensory burst of flavours of mint, coriander and a perfect blend of exotic Indian spices. 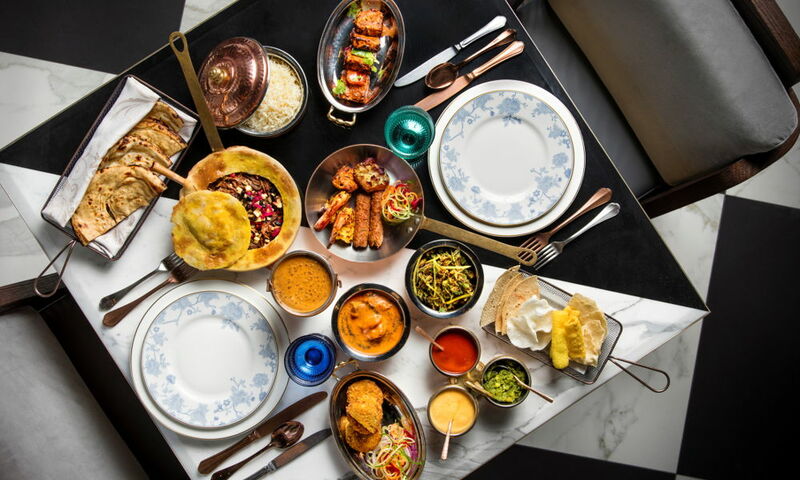 We asked for the main course to be served a short while later as we wished to let the royal flavours of Awadh, linger on our palates for a little while longer. Baloo recommended we try the ‘Santra Mantra, a citrus blast and a great combination of orange (santra in Hindi) and mantra (magic). Dark aged Indian rum matured with sherry, fresh passion Fruit puree, orange liqueur and an orange bitter with some fresh orange juice, with each divine sip, gave us a delicious citrus blast with a smooth fruity finish. The drink complimented the sweet and spicy mix of Indian flavours we were experiencing at ‘Little Miss India’ that evening. The immensely talented, but yet so humble, Chef, Mohammad Arif, next sent us the Chicken Tikka Masala, succulent diced pieces of tangy and spicy chicken tossed with onions and tomatoes and served in a delicious curry. The Tandoori Raan, a house speciality offered us a leg of lamb, marinated and slow cooked for 8 long hours. This was served to us with a Butter lentil curry, known as a Dal Makhani along with some flaky naan bread. For us this was like feasting in ‘food lovers paradise’, with each delectable morsel placed in our mouths, taking us on a long ,mysterious and exciting journey into the dessert lands of Rajasthan in India. 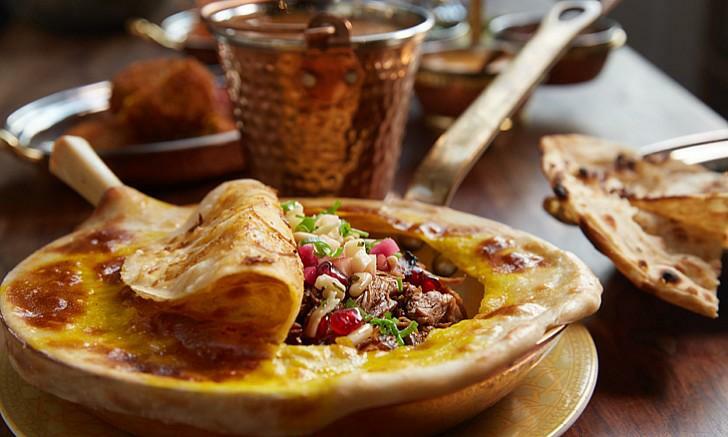 The Lamb Dum Biryani, fragrant long grain basmati rice with saffron and slow cooked in a sealed clay pot was the kind of food enjoyed by the Maharaja’s of India. In the days of old, ancient family recipes were such closely guarded secrets, that legend has it that wars were fought by Kings, just to get hold of these recipes. True or not, Laveena and I believed that the tender lamb biryani recipe of ‘Little Miss India’, possibly could be traced back to the palace kitchens of one such kingdom. Chef Arif insisted we sample the Goan shrimp curry with coconut, cumin, tamarind and chill, a dish which was a perfect accompaniment to every other valuable culinary jewel on our plates. No visit to ‘Little Miss India’ is complete without treating oneself to some of the sweet offerings on Ms. Mohini’s menu. Baloo informed us that a house favourite was the Phirnee Brûlée, the delicately cooked milk, coconut cream with rice, blueberry and a brown sugar caramel crust, while the carrot pudding, the Gajjar Ka Halwa, with coconut ice-cream was also a must try. All of this was topped with some seasonal flavoured indian kulfi, thickly rich with cream and that feeling of immense goodness and satisfaction. At the end of our most enjoyable meal, we were very lucky to meet with Mr. Anup Pawar, the young and accomplished Executive Sous Chef at the Fairmont The Palm. 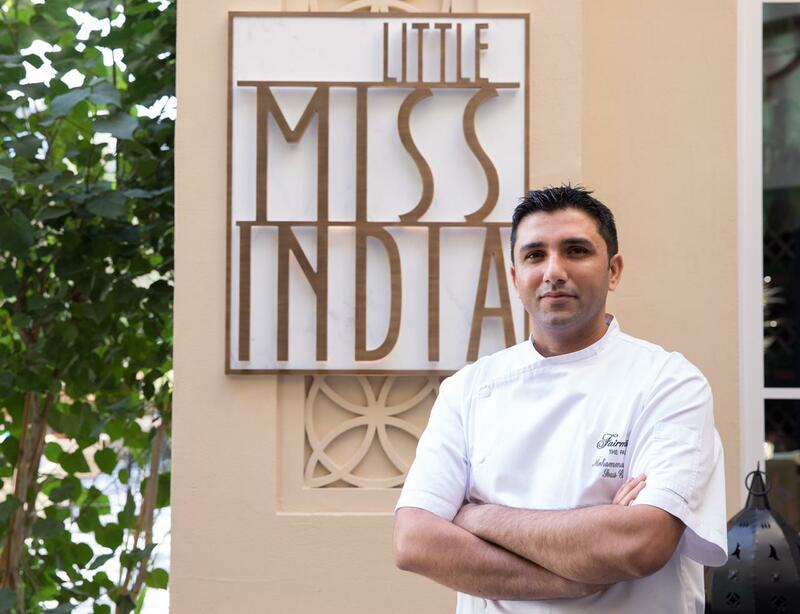 He asked us what we thought about our experience at ‘Little Miss India’ to which Laveena promptly said, “ Chef, this is one of those restaurants, worth taking a flight to eat at”. 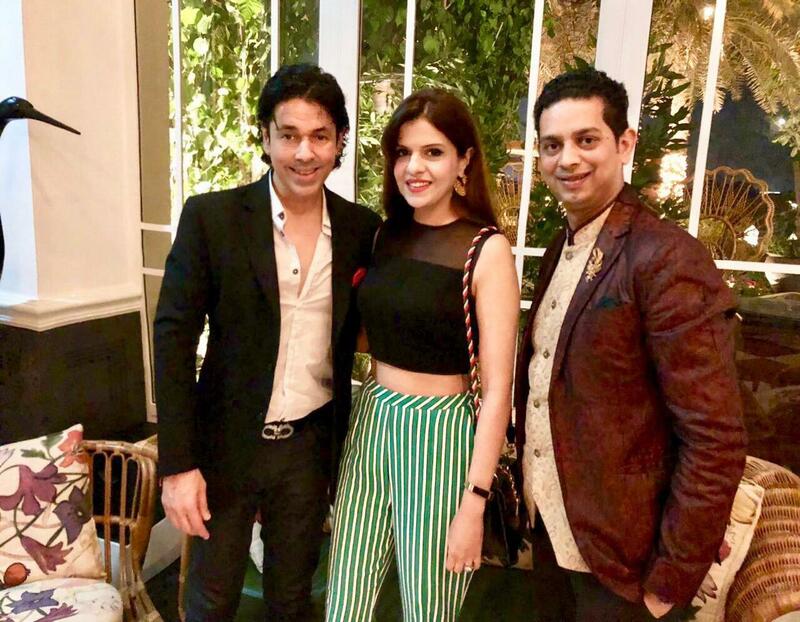 I agreed and added, “ every travelmango reader and follower, who loves Indian cuisine, has to celebrate at least one special occasion at this delightful restaurant. 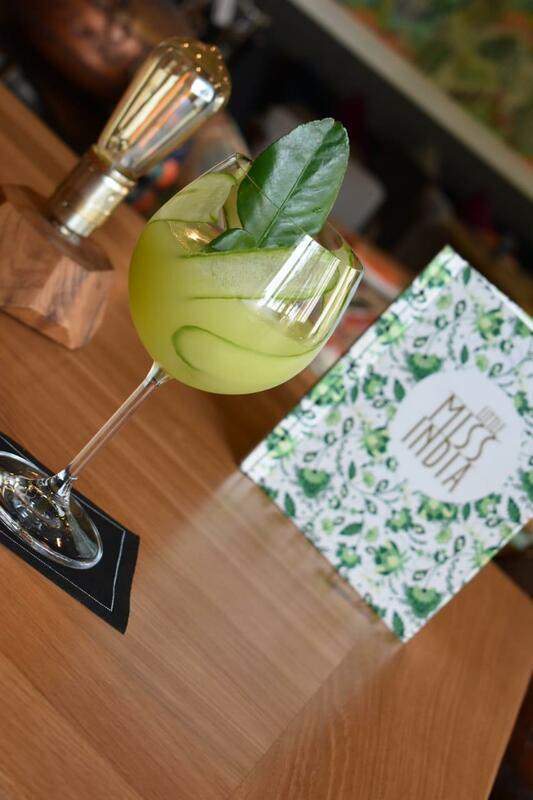 ‘Little Miss India’, has forever found a place in our gourmet hearts.” I was quick to add, ” We cannot wait to return Chef Anup and Chef Arif.” And we did, the very next day. Thank you Chef Anup for your very kind comment Laveena and I look forward to returning to ‘Little Miss India’ on our next visit to Dubai. The decor of ‘little Miss India’ looks so stunning, colorful and brilliantly thought out. Looks like everything exceeded expectations. Thanks for this wonderful article will surely visit there on my next visit to Dubai. After seeing all your pictures i feel like Little Miss India would be a fantastic restaurant with excellent traditional Indian food. 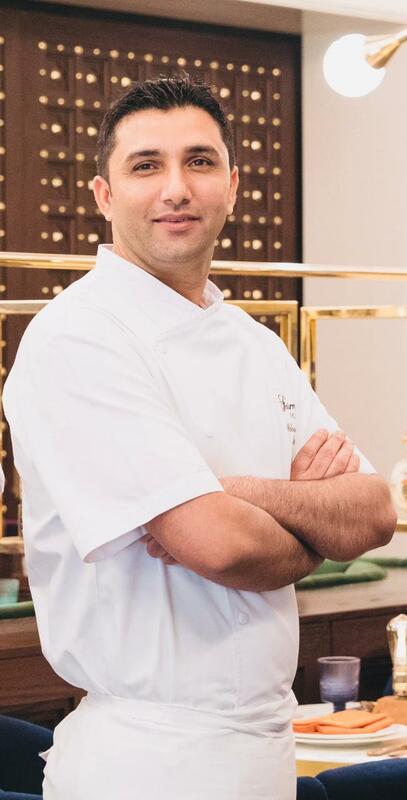 Chef Arif looks like a genius would love to try his food when i visit Little Miss India. What a delightful experience! the pictures are stunning. 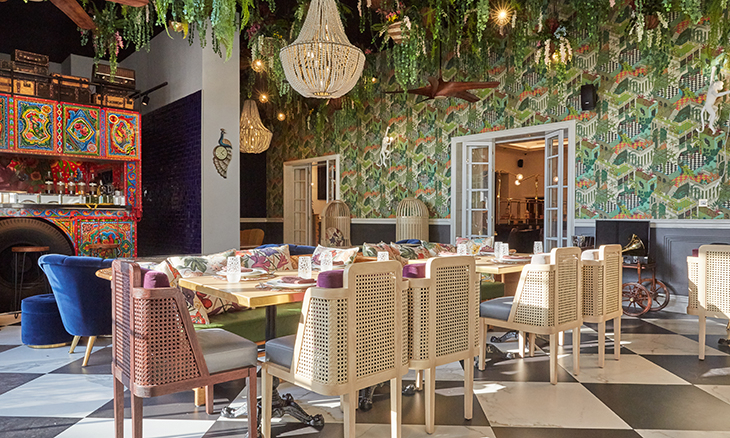 Restaurant decor looks beautiful inside. I had read about Chef Arif he is just an amazing chef. That meal sounds finger-licking good! I am going to pin this post for later. Thank you for sharing it. The meal appears outstanding. I would love to visit little miss India. The ambience and food both seem magical. This place deserves all the good reviews. Food is great, lots of nice touches, delicious The decor and objects of art are stunning, colourful and brilliantly thought out. The food looks so delicious! How i wish i could taste it too and the pictures are so good that they don’t fail to give us the feels. And haha, I like the name of the place. Good one . I have seen somewhere on TV that Chef Arif is an amazing chef.. The hotel decor is looking so beautiful and luxurious. It must be an wonderful experience for both of you. Wow everything is just so top notch at Little Miss India. I can imagine the quality time. E you spent there. Who would not like to have such an experience. Great write up. Yes Nisha, it was a wonderful experience. Wow! These all looks so amazing, i have planned my trip to Dubai this Jan will surely visit Little Miss India. Really loved the way you have described every thing. Dubai in January 2019. I only hope they have some delicious vegetarian dishes too. The picture you have shared in the blog looks stunning. I will surely come to your place for dinner when I will visit Dubai.